Welcome to the second of our four-part series previewing the Ontario Hockey League season. This time, we will preview the OHL’s East Division, aptly named as the other half of the OHL’s Eastern Conference. Once again, we will break down the East Division and tell you why each team will or won’t make the playoffs, their biggest concerns, and the player to watch on each team this season. Why they make the playoffs: The 67s have some outstanding talent up front this season. The Colorado Avalanche took Travis Barron in the seventh round of the 2016 NHL Entry Draft after seeing what the young winger’s size could do in the post-season. Barron scored six points in five games and should be able to take his game to the next level this season. Artur Tyanulin and Sasha Chmelevski will also electrify OHL crowds this season with their offensive talent. This young team is full of offense and will score plenty of goals this season and into the playoffs. Why they miss the playoffs: While Ottawa has a solid forward group, the defense on this team could be a bit problematic. It could feature three rookies on any given night this season, highlighted by 11th overall pick Peter Stratis. It will be a tall order for Jacob Middleton to play more than he did last year, however, he may have to, given how inexperienced the defensive core is this season. Inexperience could really hurt the 67’s in their own end this year and could cost them a shot at the post-season if these young players can’t adapt to the league quickly. Team Concern: Secondary scoring could be an issue this season in Ottawa with the loss of veterans like Nathan Todd, Dante Salituro, and Jeremiah Addison. It is still a fairly young forward group and while somewhat experienced, it remains to be seen which players will move into a top-six role this season. Player to watch: Normally, we reserve this spot for a player to watch that is up-and-coming. In the case of the 67s, we are not going to do that. Our player to watch is Russian goalie Leo Lazarev; otherwise known as the human warm-up highlight film. Seriously, just watch him in warmup and we dare you to disagree. Lazarev has some of the most interesting pre-game habits on the ice you will ever see. They say goalies can be quirky, but he may be the crown prince of quirky in the warm-up. Otherwise, the third-year goalie stabilizes the goaltending position this season in the nation’s capital; and that’s much needed given the young defense in front of him. Why they make the playoffs: This Bulldogs team is an impressive group up front. Niki Petti, Trent Fox, Matt Luff, Brandon Saigeon and import Marian Studenic make up a very skilled top six at forward. As if that’s not enough, the team also has Matthew Strome and MacKenzie Entwistle in the mix as well. The team will also integrate third overall pick in the OHL’s Priority Selection draft Connor Roberts into the lineup this season. Depth is important in the OHL and this team has a tremendous amount of depth at forward for this season and beyond. Why they miss the playoffs: Hamilton fans can rejoice as this team really shouldn’t miss the playoffs. Much like the Mississauga Steelheads, this team will be involved in the OHL’s second season unless disaster strikes. Team Concern: Captain Justin Lemcke missed most of last season with an injury and the team was quite different on the blue line when he was out of the lineup. They need Lemcke to stay healthy this season, in order to maximize their potential for home ice beyond the first round. Player to watch: While the team should be pretty good as a whole, it’s pretty obvious who to watch here. Matthew Strome is ready to show that he’s more than just the third Strome brother to play in the league. The youngest Strome beat oldest-brother Ryan’s OHL rookie point total by 11 and fell just a point shy of Dylan’s rookie point total. Simply put, Matthew Strome is a player in this league. With good size (6-foot-3 and 203 pounds), Strome is ready to make his mark and will try to be the third member of the family to be taken in the top ten of an NHL draft. While it’s hard to fathom he’ll reach Dylan’s point total in his second season (129 points), he may come close to challenging Ryan’s 106 total from his second year. The sky is the limit for the youngest Strome brother this season. Why they make the playoffs: At the risk of sounding repetitive, we have another team in the Eastern division that has a lot of talent up front. Oshawa still has Tampa Bay prospect Anthony Cirelli, Kenny Huether and Joe Manchurek around from their Memorial Cup Championship team two years ago. They will provide excellent leadership for a relatively young, but talented group of forwards. 2015 OHL Priority Selection draft first rounders Jack Studnicka and Robbie Burt are joined by the offensively gifted Danil Antropov this season. If the name Antropov sounds familiar, it should be; Danil is the son of former Toronto Maple Leafs forward Nikolai Antropov. Why they miss the playoffs: Players like Robbie Burt and Jack Studnicka must make a big leap forward offensively in order for this team to finish high in the standings. It’s possible they don’t and if that happens, Oshawa management may try to move veterans like Cirelli and Huether to a contender. That isn’t a likely scenario but this player movement may happen should the Generals find themselves out of the playoff picture. Team Concern: Overage goaltender Jeremy Brodeur is back in goal and is joined by 17-year-old Kyle Keyser from the Flint Firebirds. While Brodeur started last season off in spectacular form, his play really fell off as the season progressed. Yes, some of that could be related to Oshawa moving Stephen Desrocher and Michael Dal Colle to Kingston but the downward spiral had begun prior to those transactions. Can he improve to become one of the top 10 goalies in the OHL this season? The jury is out on that but Oshawa will need him solid in order to challenge for home ice in the playoffs this season. Player to watch: Mitchell Vande Sompel returns to the Generals for his fourth, and likely last OHL season. 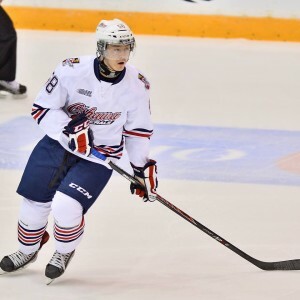 Vande Sompel, a New York Islanders third round pick in 2015, will quarterback the Generals power play and may once again play forward on Oshawa’s penalty kill. While he’s not blessed with great size, his hockey sense and ability to move the puck is second to none in the league. If he can get back to scoring over a point a game once again this season, Oshawa could be a fun team to watch. Why they make the playoffs: So much of what this team could potentially do hangs in the balance of Lawson Crouse’s status. Will Crouse return to the OHL again? Crouse almost made the Florida Panthers as an 18-year-old last fall and has been traded to an Arizona Coyotes team that could use his size up front. The catch is whether or not Arizona wants to have yet another young forward in the lineup with Dylan Strome likely joining second-year forwards Domi and Douclair this season. If Crouse comes back, things could change dramatically in Kingston this year as his presence really helps the scoring depth of this team. Why they miss the playoffs: Losing Crouse, Spencer Watson, and Warren Foegele in addition to Juha Lammikko and Michael Dal Colle would be crippling to Kingston’s offense. How does Head Coach Paul McFarland possibly replace that goal scoring? Jeremy Helvig should be solid in between the pipes again but it’s hard to win in the Ontario Hockey League without goal scoring; the remaining veterans will need to step up this season. Team Concern:Depth all over the lineup is a bit of a concern. The team should also be without Captain Roland McKeown and Stephen Desrocher on the backend. Jacob Paquette and Liam Murray are both effective players and they will need to elevate their respective games on a team that could dress three rookies on defense this season. Player to watch: Jeremy Helvig came out of nowhere to steal incumbent Lucas Peressini’s job last season after posting a .862 save percentage in his rookie season. During Helvig’s struggles that season, Peressini was on his way to winning the OHL’s goalie of the year award that season. Fast-forward a year and Helvig came out of nowhere to become the number one goalie on the Eastern Conference’s top team. Which Helvig will show up this season? While it’s doubtful his play will fall to that of his first season in the league, it’s hard to believe Helvig will be as good as he was last season behind a veteran team. One thing’s for certain; the Carolina Hurricanes are going to find out a lot about the goalie they took with pick #134 in the 2016 NHL Entry Draft. Why they make the playoffs: Well the Petes have gone out of their way to load up on European players this year, selecting Russians Pavel Gogolev and Semyon Der-Arguchintsev in the OHL Priority Selection draft this spring. That wasn’t a typo, they were taken in the OHL Priority Selection draft and not the import draft. The Russian pair also joins a pair of European import players up front in Peterborough on what could be a dynamic and underrated group entering the season. Steven Lorentz and Jonathan Ang are also back up front and could help make this Peterborough forward group one of the fastest in the Eastern Conference this season. Why they miss the playoffs: Dylan Wells has clearly been anointed the number one goalie in Peterborough this season. 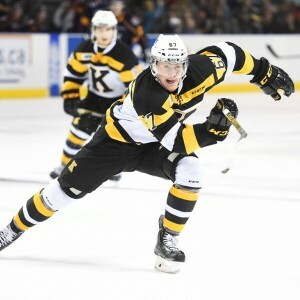 The team clearly sent that message by dealing Matthew Mancina to Mississauga earlier this month and has yet to replace him with a proven backup. While the future should be bright in the Petes’ crease, Wells is still relatively unproven as a number one goalie at this point in his career. Wells’ career save percentage is .882 and it will need to be much better this season should the Petes want to make some noise in the Eastern Conference. The Edmonton Oilers’ prospect should be able to handle the workload; however, there isn’t a backup plan should Wells falter. Team Concern: Inexperience at the goalie position and depth up front could be an issue if the import players and Priority Selection Russian players fail to adapt to the long Ontario Hockey League season. Player to watch: Declan Chisholm was a player many thought would be a first-round pick in the OHL’s Priority Selection draft this spring. It didn’t quite happen like that, with Chisholm falling to the second round of the draft. The 6-feet tall Bowmanville native instead landed close to home with the Petes and feels he has something to prove to the rest of the league when he wasn’t a first-round selection. Chisholm has three points in four preseason games and looks to have a bright future in the league as a member of Peterborough’s defense. As this series continues in the coming days, our focus will switch to the OHL’s Western Conference featuring powerhouses like the London Knights and the Windsor Spitfires. The Western Conference promises to be exciting this season and we will break it all down starting with the Midwest Division later this week.